The New York Giants on Thursday officially placed safety Landon Collins on injured reserve, ending the two-time Pro Bowl selection's season. Collins suffered a partially torn labrum in his shoulder last Sunday in the Giants' overtime win over the Chicago Bears and will reportedly undergo surgery. The club signed defensive back Kenny Ladler from the practice squad to take Collins' spot on the roster. Ladler has six tackles in five games this season. The club also signed punter Brock Miller to the practice squad. While denying Wednesday the team had made a decision on whether to shut Collins down, Giants head coach Pat Shurmur lauded Collins' grit. 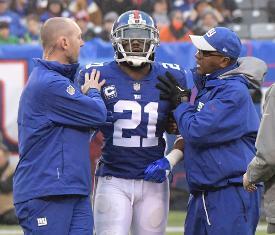 "In a sport where toughness is required, Landon Collins has a lot of it," Shurmur told the media. Collins, 24, is scheduled to become a free agent after this season. This is his second straight season cut short by a December trip to injured reserve. He missed the 2017 season finale after suffering a broken arm. Collins has led the Giants in each of his first three seasons, and his 96 tackles this season are tops on the team.